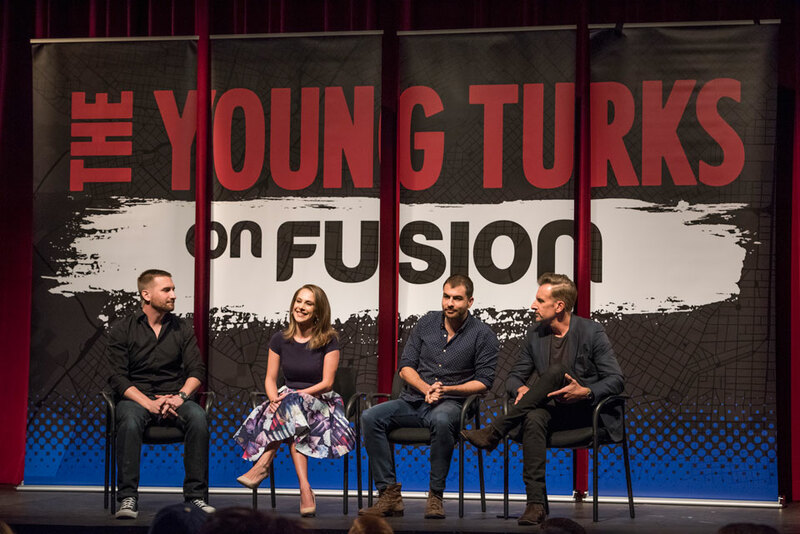 “The Young Turks on Fusion” features (from left) John Iadarola, CSUN alumna Ana Kasparian, Fusion host Nando Villa and producer and former Daily Show contributor and commentator Brian Unger, in a live broadcast from the Little Theatre in Nordhoff Hall, Nov. 9, 2016. Photo by Lee Choo. Just three months ago, when The Young Turks on Fusion — the weekly, election-focused show from TYT Network and Fusion — booked the Little Theatre at California State University, Northridge for a post-election live wrap-up show, they had no idea they’d be broadcasting their cable TV show in the wake of the emotional storm of the largest presidential race upset in modern history. But that was the hand they were dealt Nov. 9. Kasparian and her co-host, John Iadarola, were joined on the theatre stage by Fusion host Nando Villa and producer and former Daily Show contributor and commentator Brian Unger — as well as San Fernando Valley native Brett Erlich, who served as the show’s emcee, to discuss Donald Trump’s victory over Hillary Clinton. “It feels really good to be here,” Kasparian, 30, told the student audience before the live broadcast began. “I came here for my undergraduate degree, my graduate degree, and then I came back and started teaching here. “I love CSUN. I have so much admiration for the school, for its administration, for all the opportunities that this school not only gave me — but more importantly, the spirit of the students here,” she said. “We’re here at California State University, Northridge, my alma mater, and it feels pretty damn good to be here,” said Kasparian, whose show has been on an election caravan of sorts, crisscrossing the country and stopping at a handful of universities along the way. Harvard is next week — but CSUN came on what, according to The Young Turks, felt like Armageddon day. Iadarola expressed his frustration with overall voter participation in the U.S.
“Almost 50 percent of the people didn’t even vote,” he said. “They were like, ‘meh’.” The panel dissected some factors they argued had contributed to Clinton’s defeat, as well as corporate influence in TV news coverage of the presidential race — and continued Republican control of Congress. “I woke up [Nov. 9] remembering the Reagan Revolution,” said Unger, referencing President Ronald Reagan’s victory over incumbent President Jimmy Carter (a Democrat) in 1980, and the concurrent Republican control of Congress. “I remember the feeling of powerlessness and hopelessness, the feeling that there’s too much consolidation of political power with one party. History shows that there was a lot of consequence to that. CSUN students, who had pre-reserved free seats in the audience, queued up outside the Little Theatre in the hour before the broadcast began. Political science major Marc Anthony Ninapaytan was first in line. Earlier in the day, Ninapaytan had helped organize a spontaneous, peaceful protest about the election results on the Oviatt Lawn, which drew a large crowd of CSUN students — as well as CSUN President Dianne F. Harrison, who joined and spoke words of encouragement to the students. The crowd was primarily made up of students from M.E.Ch.A. (Movimiento Estudiantil Chicano de Aztlan, one of the largest and oldest Chicana/o student organizations in the country), as well as undocumented “Dreamer” students. Clinton won California in a landslide, with more than 60 percent of the state’s popular vote. The Young Turks on Fusion premiered live on Sept. 12 from the University of Southern California. Hosted by Kasparian and Iadarola and various voices from Fusion’s editorial team, the show aims to discuss the most important issues facing young people this election season. In addition to its Harvard stop, after CSUN, The Young Turks will continue its nationwide tour with a broadcast from the University of Arizona. “Has anyone ever been to a live TV taping?” Erlich asked the student audience in the minutes before the broadcast began. Nearly every hand shot up. He also gave a shout-out to a beloved CSUN landmark — the avant-garde, 3D “CSUN” sculpture at the corner of Nordhoff and Zelzah (also nicknamed the “worm sculpture” or “noodle sculpture”): “It’s made of giant pieces of Top Ramen,” Erlich joked. TYT Network is the largest online news network in the world, covering politics, pop culture and lifestyle. The network is one of YouTube’s top partner channels, and has more than 200 million views a month and more than 3 billion total views on The Young Turks YouTube channel and Facebook page. The Young Turks was recognized on Variety’s “Famechangers” list, The Hollywood Reporter’s “Next Gen 30” and has won the 2013, 2014 and 2015 People’s Voice Webby Awards for best news and politics series. The Young Turks is the flagship show of the TYT Network. Fusion content is available across a broad range of platforms, from cable TV and Fusion.net to social media channels. Fusion is a part of the Fusion Media Group, a division of Univision Communications Inc.
Kasparian joined TYT as a fill-in producer before her 2007 graduation from CSUN, and she quickly rose through the network’s ranks to her current post. She also served as producer and contributor for the Current TV show. During her tenure, The Young Turks has received numerous accolades. She is also a frequent contributor on Pivot’s Take Part Live. This year, Kasparian was named to Forbes’ list of “30 under 30” people in media list. “The Young Turks on Fusion” features (from left) John Iadarola, CSUN alumna Ana Kasparian, Fusion host Nando Villa, producer and former Daily Show contributor and commentator Brian Unger, and emcee Brett Erlich in a live broadcast from the Little Theatre in Nordhoff Hall, Nov. 9, 2016. Photo by Lee Choo.